I don't remember a time when I didn't know how to read. I don't remember learning how, all I remember in my life is knowing that I could and knowing that it made me feel powerful, because I could take myself any place in the world with just a book. This is a testament to my family. Even when I was an infant, both my parents, and several of my grandparents read to me fervently. Once I was old enough to see words and pictures, they were careful to point to each word as they said it. When I started to talk, they started encouraging me to associate words I said with words that were on the page. And even my dad, who is not a big reader himself (but has become a YA convert), really enjoyed reading to me, even before I could hold my own head up. I was blessed with a family of people who loved books and reading. It's not a bragging point, but when I was in kindergarten, they ran out of things for me to do in the first few months of the school year because I was already at a middle school reading level and they'd send me out to fourth and fifth grade classes to read chapter books to them and help them with their reading problems. Reading has always been my thing. This adventure was special because it was just me and my grandpa. It was after the first day of school, which was a half day and which meant we were going to the mall where he went walking every day. We'd have lunch, and after he got his after lunch coffee, we would go to cookie shop next door and get a fresh baked cookie. My favorite were the butter-sugar cookies were dusted with granules of sugar on top so big that they sparkled in the light of the case. On that particular day, my first grade teacher had started reading to us The Little House in the Big Woods, the first in The Little House on the Prairie series by Laura Ingalls Wilder. My teacher made us a promise that she would read us a chapter each day. Though I knew she'd make good on it, I was impatient. (This is something that has NOT changed about me at all, especially when it comes to books.) I wanted to know what happened next. Most of my classmates were not reading chapter books yet, but I had been for over a year. My grandpa was so excited that I was so enthusiastic about these books and took me to the bookstore in the mall after I ate my cookie to go look for the book and maybe the next one in the series. The bookstore was called Coopersmith's. We found the book and not only did they have it and the next book, they had boxed sets. There was a boxed set with the first five books, one with the last four books, and one that had all nine of them. In the very early nineties, the mall was still a pretty safe place and the bookstore was among the safest. He briefly left me to make my decision between which of the smaller boxed sets I wanted while he got a refill on his coffee and came back. When he asked me what my decision was, I looked up at him with tears in my eyes and said, "Grandpa, I don't know. I love them all. I'm so sad that I have to pick just one boxed set. I think I'll just cry." I was genuinely sad. Having to choose between all these amazing books, in this wonderful smelling bookstore that I had quickly decided was heaven was just too much for me. I wasn't just trying to guilt him or lay it on thick. I was really, really sad. And I broke his heart saying that, so he naturally bought me the big full series boxed set. My mom and I finished reading Little House in the Big Woods in just a couple day and quickly moved on to the next books. My first grade teacher was furious that I'd gone ahead of the class, even though I'd promised that I wouldn't tell my classmates what happened. But eventually, she got over it and even put me in an advanced reading program meant for second graders. That was my first experience in a brick and mortar bookstore that I remember. This was long before the Internet was a thing that everyone used and long, long before Amazon. Barnes and Noble hadn't even moved into our area yet. The bookstore soon became my favorite place to go with my grandpa and became a regular ritual for us. Though he died of a heart attack (much too young) just a few years later, those memories are the ones I cling to. My mom's mom and I didn't get along well for most of her life. She was an alcoholic with a lot of resentment issues and she was jealous of the relationship that I had with my grandfather as a child because she felt I took him away from her. But despite that, even she kept up the tradition of taking me to the bookstore regularly because she knew it's what he would've wanted. Even in the last years of her life when she could barely walk and I was in college, she still took me to the bookstore every year for my birthday to pick out books. And when I started having to have multiple surgeries, she always took me to the store to pick out a few books to read during my recovery. It's one of the few things about our relationship that she did right. My grandparents on my dad's side were also huge readers and though they lived a little further away, they loved to take me to the bookstore when I was up north (in the thumb of Michigan) visiting them. We often took special trips to Port Huron, which was an hour and a half away from them, to go to the nearest Barnes and Noble. They gave me books as Christmas gifts from an early age. As I got older, my grandma would buy books to have waiting for me when I got to their house for my summer and winter visits. My first "classic" was Pride and Prejudice. It's still one of my favorite books and my copy of it, the last book my grandma gave me before she suddenly passed away of a heart attack (also much too young), is worn and battered, read over and over again with love. In short, some of my best childhood memories took place in bookstores. And now that all my grandparents have passed on, I still feel closest to them -- especially my mom's dad and my dad's mom -- when I am in a bookstore. The little bookstore in the mall that my grandpa took me to, long before the local Barnes & Noble was built, eventually became a small Borders, and when Borders went under, it was turned into a store for Irish memorabilia. That was the first sign to me that the book industry was changing and that brick and mortar bookstores were in danger. I know it was before then, but that's when it really hit home for me. I'd long been an Amazon customer, but at that point, despite the fact that Kindles were then becoming widely popular, I decided to stop using Amazon to order books. I'd use them for other things, but not books. If I buy hard copies of books, I try to go into the store to buy them, even if it would be cheaper on their website. I'm willing to pay a couple extra dollars to keep their shelves full and their store standing. The only time this changes is if I have a coupon, if someone else is ordering them for me, or if I'm ordering a LOT and the discount is just too good to pass up. And until recently, I only ordered from Barnes & Noble or Books-a-Million. I never order hard copies of books from Amazon unless I'm given a gift card. I resisted the e-reader trend for a long time, but eventually caved and bought a Nook. It's simple Nook reader and it's really all I need. The only reason I could see myself upgrading is if I wanted to get the backlit version (which came out days after I ordered mine, of course). I love how long the battery life lasts and that I don't get a glare. Simple is fine by me for this. I feel like this way, I'm at least supporting stores that, while they have an online component, also have a brick and mortar store. Because I never want the experience of going into a bookstore to go away. It's my happy place. My place to relieve stress. I cannot tell you how many times after a trip to the cancer center that I've gone to the bookstore just to decompress, have a coffee, and get a pick-me-up in the form of a book. Now, a couple of years ago, when my dad started playing games on his phone and watching videos and was having trouble seeing, my mom, brother, and I chipped in to get him a Kindle Fire. When he upgraded to a sleeker tablet this past year, he gave his Kindle Fire to me "on loan", though I've been using it for about ten months. I ONLY use it for books if I have a gift card. Otherwise, it's specifically for advanced reader copies that I get electronically from Edelweiss or Netgalley, since they both deliver to the Kindle much more easily than the Nook. The only time I've made an exception is when I accidentally pre-ordered a copy of Kiera Cass's The One when it was released. Otherwise, not a dime of my own money has gone to purchase a book on the Kindle Fire and I only use it for books that are gifted to me for a review by a publisher. I haven't been following the Amazon/Hachette battle that closely. All I know is that they are making things crappy and difficult for some authors that I really love. That bugs me. I'm not riled up, but it definitely has left a bit of a sour taste in my mouth. But it doesn't really change anything for me -- I don't buy my books from Amazon anyway. One thing that my area of Michigan is sorely lacking in is independent bookstores. We have a lot of B&N stores and a few Books-A-Million's, but not a lot of independent stores. The ones that are independent do not have a great YA selection. The closest for me is Schuler Books which is in Okemos and is a 45 minute drive from me, but can be an hour and a half away depending on road construction and time of day. But I do go there for events and always love it when I go. 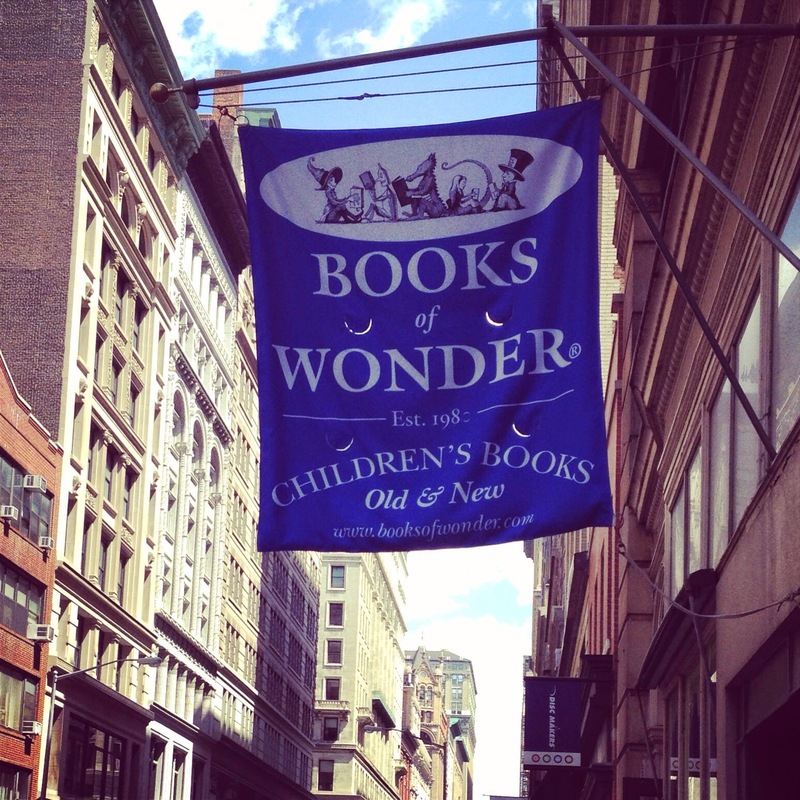 When I went to NYC a couple of weeks ago, I made it a point to go to the famed Books of Wonder. I've heard amazing things about them via Twitter and from other bloggers and I knew they play host to awesome events for YA/MG and children's authors often because that is their area of expertise. They cater strictly to those audiences. Last year, I couldn't visit them, but I put them on my calendar for several events this past trip and I went back one more time to pick up a few books I'd missed out on at BEA. In all, I think I went there four times in 18 days. And that's not including the large pop-up store that sprung to life at the 92nd Street Y for the Cassandra Clare/City of Heavenly Fire release party. It's officially become my favorite bookstore in the whole world. And there's a cute little cafe and places to sit and just read, and I can see that when I move there, it will become a regular fixture in my life. I could hole up there and read all day. I mean, just look at how many times I went there in 18 days. And because they have so many awesome events, regularly, you can often autographed copies of books. It's a little slice of book heaven on earth. With an extreme lack of local stores in my area to support, I don't feel bad saying that I will continue to support Books of Wonder from Michigan until I'm a New Yorker myself and will be making it a point to do any book ordering from them. I don't want to live in a world where brick and mortar book stores do not exist. I don't want my nieces to grow up in that world, either. I want to do everything that I can to support these places. So going forward on my book reviews, promos, etc., I will NOT be giving buy links for Amazon. I WILL be including links to Books of Wonder (they will ship to you -- and they might even have autographed copies! ), Barnes and Noble, and Books-A-Million. Occasionally, Books of Wonder might not have the book available on their website, but you can always call and ask, and you can also always search YOUR local independent bookstores. I recommend Amazon for a lot of things. For my trip, I was able to find a comfortable pair of Reebok Skyscapes, a collapsible pink luggage cart, a memory foam travel pillow, and a Jackery (a device that holds that full extra charge for an iPhone and that can be plugged into revive yours on the go), all for under $150. They all got to me in just days. I have no problem with Amazon as a marketplace for technology, entertainment, and all other things you need in life. But for books, I choose to go to the experts, who I know are not going to be in the middle of some sort of publishing battle. And this is really not to take a stand against Amazon for the Hachette thing. It's a tiny factor, not a big one. I don't know enough about it to get bent out of shape about it. I've been considering doing this for a long time now, long before that was ever an issue. And going to Books of Wonder in NYC and having some great experiences at my local B&N and Books-A-Million lately just solidified my feelings about this. This is just to stand up for places I love, that bring me back to my childhood, that shaped me, that were places where I made some of my fondest memories, and that continue to bring me peace and solace. And that I know bring others the same sort of joy. I don't want book stores to go away. So this is the very small way I'm supporting them. I know I'm only one person, but I hope that if even one or two people started to buy their books this way (or support their local stores), it would make a difference.